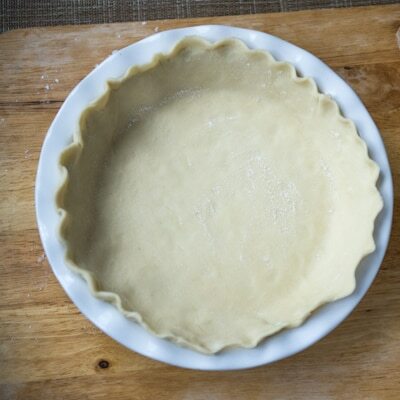 Homemade Pie Crust Recipe is a no-fail recipe made easily with ingredients usually found in most kitchens. Be sure to use cold water and keep well-wrapped until ready to use. COMBINE flour and salt in medium bowl; cut in vegetable shortening with pastry blender or two knives until mixture is crumbly. Sprinkle with water; blend until mixture holds together. SHAPE dough into ball; place on lightly floured surface. Roll out dough to 1/8-inch thickness. Line pie plate with pastry. Turn edge under; crimp as desired. NOTE: To make two crusts, double all ingredients, follow procedure above, and divide dough in half. *Add 1 additional tablespoon water as needed.